Knebworth not being filmed must be their biggest regret. The few seconds of crowd footage filmed from Helicopter behind and above the stage, is one of the best ever. musicalprostitute wrote: I don't think Rami was thinking about an Oscar two years before he was given the role - and two years before he was given the role he had already begun investing his time and money learning all he could about Freddie. Say what you want about the man, but he has been passionate and dedicated about this film from the very start (well, before even). You will leave the theater totally blown away. You just don't know it yet! Another_Roger wrote: Did Queen really peak at Live Aid? As a performance it is among the most famous ones because they did well, and it was watched by a billion people. But the audience at Wembley did not come to see Queen. That was a mixed audience. Knebworth Park was an audience that came to see Queen. The biggest confirmation they ever got in terms of greatness. As we all know the Knebworth visuals were never recorded. It would have been so great to see that huge concert recreated. But I guess that wont happen. Could have looked absolutely gigantic and epic compared to Live aid. Isn't part of what makes it great that it wasn't a Queen audience? And that even so the whole stadium was with them from the first notes of Bohemian Rhapsody on Fred's piano? That 70,000 people sang along to Bo Rhap then clapping to Radio Gaga and responding to Fred's best ever call and response? That it was a non-Queen audience doing all that is the best possible demonstration of how much Queen's music was integrated into our popular culture and how extraordinary the band was live? Especially Fred? Knebworth was an astonishing farewell, but I'm really hoping that the film makes Live Aid look epic, as it really was. Faellie wrote: Isn't part of what makes it great that it wasn't a Queen audience? And that even so the whole stadium was with them from the first notes of Bohemian Rhapsody on Fred's piano? That 70,000 people sang along to Bo Rhap then clapping to Radio Gaga and responding to Fred's best ever call and response? That it was a non-Queen audience doing all that is the best possible demonstration of how much Queen's music was integrated into our popular culture and how extraordinary the band was live? Especially Fred? Good point that! It was certainly special that Queen made a "neutral" audience go crazy like they did that day! I actually think the movie will make it sound much better than it actually was. I am not sure how the sound was in the stadium. But the sound we have heard from the DVD ( and other sources) is quite weak. In my opinion Live Aid wasn't musically that good. But the show Queen put on that day was what made them single out. (And the big hits everyone knows) Freddie's showmanship took Queen to a level no other act could match. musicalprostitute wrote: I think the 'new' Memorable Live Moments montage recently put up on Queenonline may give us some indication as to what live shows will be shown in the film. Not so sure about that. I doubt very much that we will see Budapest and Knebworth. The Wembley show wasnt even in that montage. Hammersmith and Madison Square Garden that most likely will be in the movie wasnt in the montage at all. But as you said in some posts above there might be a montage somewhere in the movie. True. I just thought it was a little too coincidental for them to be putting up a live montage a couple of months before the release of the film - but you are quite correct about Budapest, I should think. I would have said the same about any Magic gigs (as they are obviously a year later than our film's end timeline), but after seeing Rami in Freddie '86 attire now I am not so sure. Watch this quotation business: otherwise we will all be saying things we haven't said! Very good point made. Live Aid was astonishing for Queen for a few reasons: number one being - as you state - this was not a Queen audience. Add to that the fact that their popularity was not at its highest at this point in time (especially after their recent-ish SA concerts and their loss of The States) and that they could not rely on their lights and costumes, etc. - so they were as naked as they would ever be. One cannot imagine what path the story of Queen would have taken had this event not taken place at the time it did. Perfect timing and a faultless, raw, spellbinding performance meant that, thankfully, their career was completely rejuvenated and taken to a whole new level. One person who will definitely be seeing this film is Rod Stewart; I have just read an interview with him in one of the Sunday papers in which he states how 'we've got to go to that'. He also goes on to describe the last time he saw Freddie: 'Queen were having a party (so I presume the party they held after the Brit Awards in 1990) but he didn't want to appear with the band. He was ill and he didn't want everyone to know...I said "Freddie, come on, keep it together, man. you've got the best band in the world". He leant around, he was really losing weight, and he said, "Rod, I'm far too tired"'. Bless him. I was too young to remember but did Queen need rejuvenated in 1985 or has this been a narrative sort of added to the legend of the Live Aid appearance over the years? I suspect the film might even play with the narrative that Queen were at a low ebb yet coming into the show yet they were coming off The Works the year before and two hit songs that are likely to never go away (Gaga and Break Free). I don't think Queen were completely lost before Live Aid, but they weren't in the best of shape either. Yes, they had a comeback with The Works, but they also shot themselves in the foot with Sun City. Furthermore, their popularity in the USA was still declining; still not recovering from Hot Space...and sadly never would fully recover. My impression was always that despite The Works being the success that it was, and providing the band with a few great singles, the band was still a bit jaded. Don't forget, Geldof had to work really hard to convince Freddie to participate in Live Aid. He just wasn't feeling it, for whatever reason. I don't think, or at least I hope, the film won't gloss over The Works. I also hope that it will address Sun City as it's an important moment leading up to Live Aid. The band lost a great deal of respect from fans and especially fellow musicians. It was not a pretty moment. 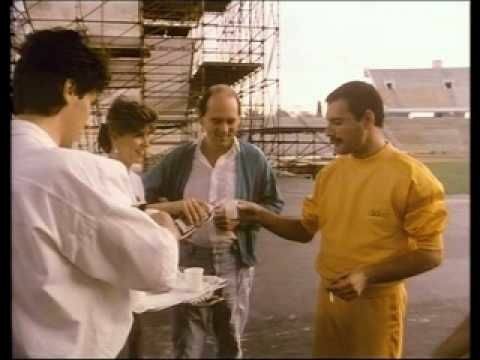 Which is why their performance at Live Aid was so surprising. BitterTears wrote: I was too young to remember but did Queen need rejuvenated in 1985 or has this been a narrative sort of added to the legend of the Live Aid appearance over the years? I suspect the film might even play with the narrative that Queen were at a low ebb yet coming into the show yet they were coming off The Works the year before and two hit songs that are likely to never go away (Gaga and Break Free). I think that after the debacle that was South Africa the previous year (yet still hanging around them like a bad smell) and then the nosedive they took in America after the Break Free video - yes, they were definitely at a low ebb. Add to this the fact that I don't think the band were getting along as well as they once did during this period (the Munich years and all the hard partying, drinking, drug taking, etc.) - they certainly were not in the best place. I am sure they would have continued in one way or another after Live Aid; but there is no way they would have reached the peak they did. This concert helped not only give the band the shot in the arm they desperately needed but also helped to cement their legacy. I do not think it can be over-stated just how important this gig was for our band. Lover Boy wrote: I don't think Queen were completely lost before Live Aid, but they weren't in the best of shape either. Yes, they had a comeback with The Works, but they also shot themselves in the foot with Sun City. Furthermore, their popularity in the USA was still declining; still not recovering from Hot Space...and sadly never would fully recover. My impression was always that despite The Works being the success that it was, and providing the band with a few great singles, the band was still a bit jaded. Don't forget, Geldof had to work really hard to convince Freddie to participate in Live Aid. He just wasn't feeling it, for whatever reason. I don't think, or at least I hope, the film won't gloss over The Works. I also hope that it will address Sun City as it's an important moment leading up to Live Aid. The band lost a great deal of respect from fans and especially fellow musicians. It was not a pretty moment. Which is why their performance at Live Aid was so surprising. I agree with this 100%. Hot Space killed Queen in the USA and they never fully recovered. Ga Ga was a hit but it just barely cracked the top 20. Body Language charted higher here in the US. BTW That video was banned here too. The Break Free video really didn't hurt them that much because the damage was already done here in the US. You couldn't even get their albums on CD here in the US. I had to get the imports until the early 90s. Wayne's World helped their popularity here in the US. That is because USA is discriminating, now led by the most discriminating president after WW2, voted for by the US people. Just joking, had to say it.. Though honestly, I have lost a bit of respect for the USA lately, with your new leader. You have to do better than that to impress me. TheHero wrote: That is because USA is discriminating, now led by the most discriminating president after WW2, voted for by the US people. We have a lot of idiots in this country. It's a very sad time for the USA and I don't see it getting better anytime soon. Roseanne Barr could be the first US woman president if she decided to run.